Antwerp, 1587. The islands are: Malta, Sardinia, Sicily, Elba and Djerba, off North Africa. Augsburg, c.1730. A superbly decorative map of Straits of Gibraltar, outlining the defences of the British fortress. 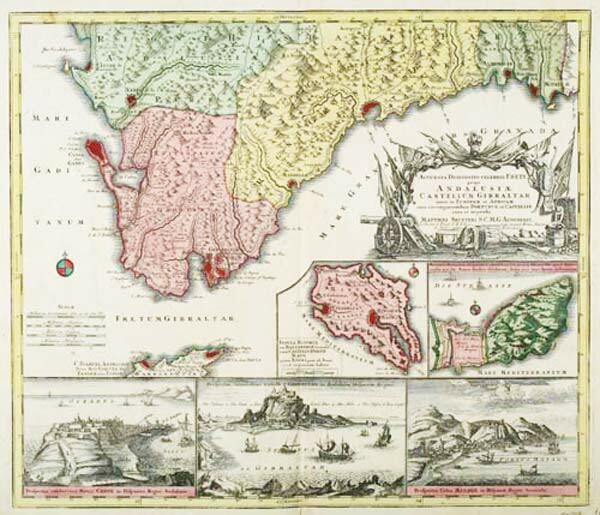 Under the map are prospects of the fortress, Cadiz and Malaga, and insets plans of Minorca (also held by the British) and the Spanish fortress of Ceuta (the other 'Pillar of Hercules'). The map also has a splendid martial-themed title cartouche. Nuremberg, 1756. Chart of the Strait of Gibraltar, orientated with north to the bottom of the map, with tables to help mariners cope with the strong tidal forces. 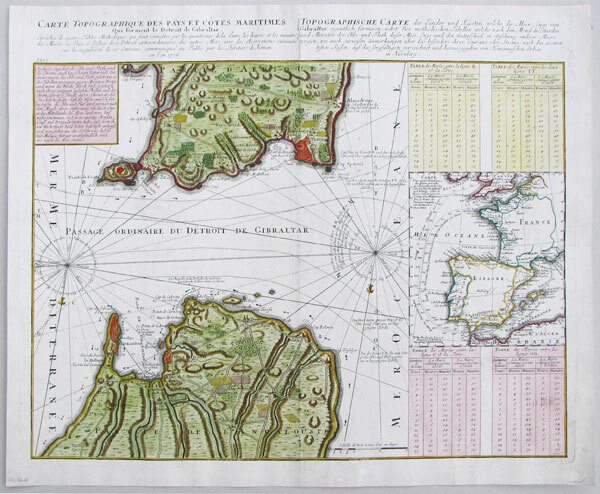 Published during the Seven Years' War, the British garrison at Gibraltar is not the focal point of the chart, but the Strait as a route to Minorca. The island's harbour, Mahon, which was a vital shelter for the British Navy, and in the year of publication of this chart the French laid seige to and took the island. An inset shows the routes of the English and French navies to the Balearics. Paris, c.1700. Valletta, with an eleven-point key, concentrating on the new fortifications, the most advanced in the world at the time.